In the last few years, Philly trio Cayetana have seen their profile explode. The group has received universal praise for their fuzzy, hooky indie rock tunes, toured the world (including opening for Against Me!) and have finally released their anticipated sophomore record New Kind of Normal. The album is also the first released for their own newly-launched label Plum Records. Longtime friends of Y-Not Radio, Augusta Koch, Allegra Anka, and Kelly Olsen have upped their songwriting game with an emotionally cathartic set of powerful songs. New Kind of Normal kicks off with the charging "Am I Dead Yet?" and never looks back. Throughout the record, Koch takes a clear-eyed look at mental health, self-doubt and interpersonal relationships. The jangly lead single "Mesa," with its chorus of "we can only hurt ourselves for so long," also includes the optimistic mantra of "together we make flowers out of weeds." The chugging "Bus Ticket" channels '90s-style angst into a powerful energy, starting from a place of depression and building to a realization that "This is the new me" and "I was made tough, like the one that raised me." Anka's bass work is a standout throughout New Kind of Normal. Go listen to their cover of New Order's "Age of Consent" to trace the influence in her playing on "Follow." And album-closer "World" feels straight out of The Cure's playbook. Anka and Olsen provide a rock-sold rhythm section under Koch's crunchy modern guitars. 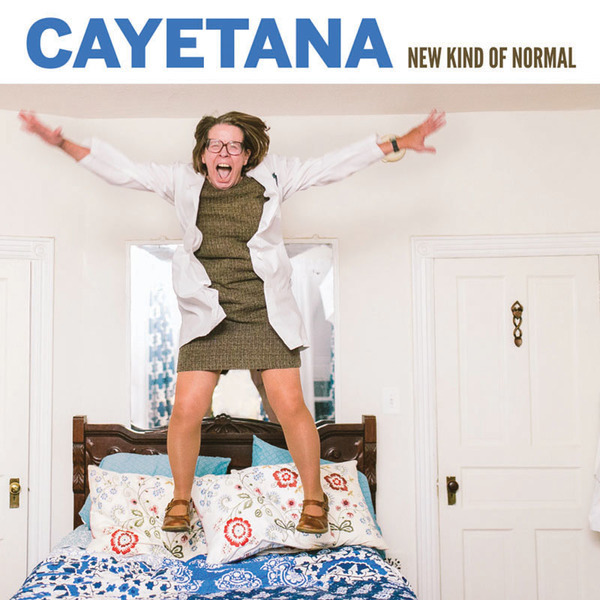 New Kind of Normal should continue to raise Cayetana's standing in the music world as they do Philadelphia proud with one of the finer albums to come from the City of Brotherly Love in recent memory. Cayetana just played their hometown record release show last Friday, but they have a date out in Lancaster on July 7th at The Lizard Lounge and will open for Waxahatchee on tour this summer, kicking off on July 14th at Union Transfer.